These imagination-driven, push-along toys take green vehicles to a smaller level. The smartly designed car, fire truck, tractor and train engine are made from recyclable and earth-friendly materials. Their convertible packaging transforms into the toy itself, reducing waste to a single piece of recyclable paper. Little road warriors will have fun assembling their new wheels and applying the included stickers, and can play with them as-is or add their own decorative flair. Sold individually. Made in China. 7" L x 3.5" W x 5" Dia. 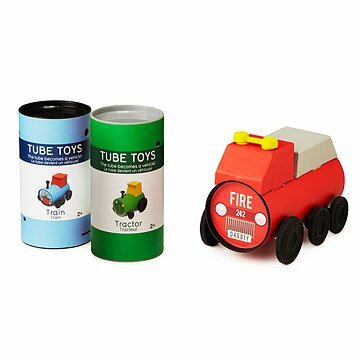 Tube Toys- Firetruck, Tractor, and Train have been discontinued. When they sell out, they will no longer be available. We apologize for any inconvenience. The packaging of these toy cars, trucks and trains transform into the toy itself, leaving little waste.